After you’ve been in an auto accident, you count your ten fingers and ten toes. Then, the stress sets in that you will have to deal with an insurance company. Don’t worry! In today’s show, I’m going to give you some tips to navigate through the process and protect yourself financially. Before we get into my personal advice on dealing with insurance companies, you’ll need to know what to do at the accident scene. Start your research with a great article from Edmunds: What To Do After a Car Accident. A few months ago my wife was involved in a minor car accident. Fortunately, she was ok and it was determined by the officer at the scene that it was the other driver’s fault. My wife did a great job of recording the contact information of the other driver, their insurance information, and even the other driver’s license number. With this information, we called the other driver’s insurance company to see if the driver had notified them about the accident. The driver had indeed contacted their insurance provider, so they already had a case number assigned. They provided us with the case number and a phone number for a case manager that we could call with questions. We contacted the case manager and she let us know that the insurance company would be sending out an adjuster to determine the value of the damage. The adjuster met us at our house and took several photos of the vehicle and said that he would file a report and we would be hearing from the insurance company soon. Within two weeks of the adjuster reviewing the damage to our car, we received a check for $2,100 in the mail. Tempting! Insurance companies are truly hoping that you’ll cash that check and they’il never hear from you again — but that could be a big mistake if you make that choice. 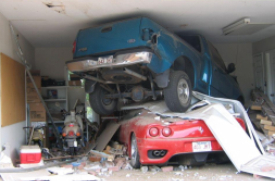 Adjusters do their best to estimate the damage to your vehicle, but their assessment is very limited. They can only see the external damage. They have no idea, for instance, if there is major damage hidden behind a bumper or if your frame is bent in a way not visible to the naked eye. So, there’s a real risk of them underestimating the damage to your car — and the expense to get your repairs done. If you had seen our car after the accident, you would have thought that it was only minor damage. My wife was able to driver the car away from the accident and we drove it for another month while we waited for our appointment with the body shop. However, consider this: the actual cost to repair the car was $2,500. Plus, it took the body shop close to three weeks to get it repaired so we needed a rental car that ended up costing us another $800. If you add those two expenses together, you can quickly see that cashing that first check and not fixing the car would not be the best long-term decision. I also wanted to give you a heads up about another money saving “technique” that insurance companies will try to use on you. My wife drives a Toyota Highlander so we expected a comparable vehicle during the repair period. When we arrived at the rental car company to pick up our loaner, the insurance company had reserved a full size vehicle (according to Enterprise, that was a Ford Mustang or Ford Taurus). This was not acceptable because we needed the third row of seats and we needed the additional storage. We called the insurance company and with a little discussion they agreed to pay the $25-day upgrade cost. Your takeaway: know the terms of your policy and don’t be shy about asking for what you’ve paid for. Thanks for listening! If you enjoyed the show, please drop by Apple’s iTunes website and leave us some positive feedback. It helps attract new listeners and encourages Apple to continue featuring the show as a recommended podcast. On the other hand, if we can do a better job, drop me an email or leave a comment here. Great podcast. FYI, one of the reasons you want to have a disposable camera is digital pictures often aren’t admissible in court because they can be manipulated. I expect that courts will be more receptive to digital pictures with time.